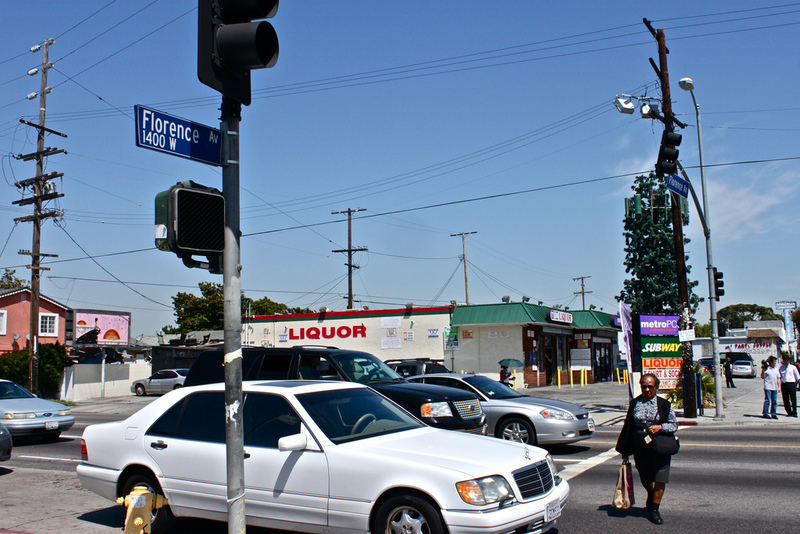 More farms might begin cropping up around South Los Angeles thanks to a proposed bill by the Los Angeles City Council. Council members Curren Price and Felipe Fuentes recently introduced a motion to provide a property tax adjustment for private landowners who convert their vacant plots into “urban farms,” which the city council defines as commercial ventures that sell food. The authors of the bill, entitled the Urban Agriculture Incentive Zones Act, said they see the property tax adjustment as a way to encourage landowners who are not using their property. Parcels of land between 0.10 and 3 acres in size would be eligible for the tax breaks. The Los Angeles Food Policy Council, which has supported previous green initiatives taking place in South L.A., estimates 8,600 parcels in the city could be eligible. To get the tax adjustment, the land must be used for agriculture and educational purposes. 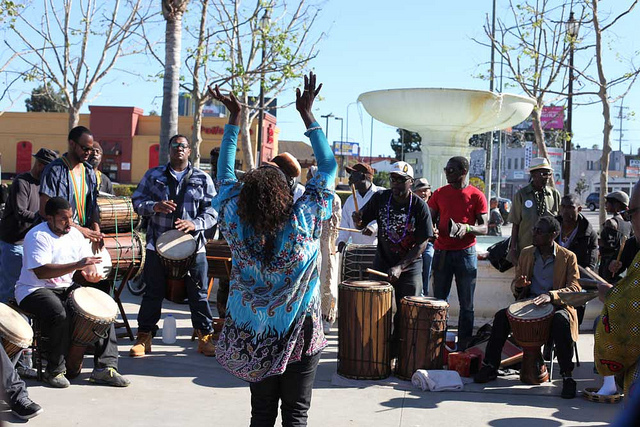 The music was blaring as residents walked the street fair on Raymond Avenue in South Los Angeles, on Saturday, to celebrate the saving of its community garden by the Los Angeles Neighborhood Land Trust and philanthropist Erika Glazer, along with the City and County of Los Angeles. A ceremony was held to announce the renaming of the the Raymond Avenue Community Garden to Erika J. Glazer Community Garden, and to unveil a new sign for the Glazer Garden, which was designed by its founder, resident Julie Burleigh. Booths were set up along the street around the DJ for residents to receive information about everything from conserving water to making a worm compost. Children lined up eager to get their face-painted, and many had their hand cupped around small, makeshift pot made out of newspaper. 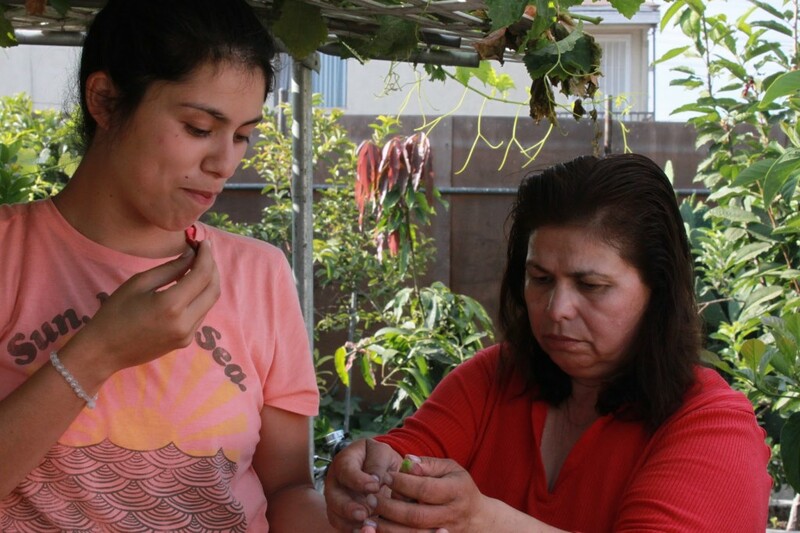 “I planted beans,” said Melissa Ramirez. The eight-year-old scooped dirt into her pot and planted her seeds, right before spraying some water on top of the fresh dirt. Nkoli Udeorji, a volunteer with the grass-roots organization LA Green Grounds, stood behind a table to show other kids how to plant their seed of choice. She said being at the event is a great way to connect with the community. “I thought we would bring the kids and let them run around,” said Karlyn Johnson, who heard about the event from another parent. Johnson lives just a few blocks away from Raymond Avenue and said she had never known there was a garden so close to her residence. “The more we can do stuff [like this] the more we can help the neighborhood,” said Johnson. Julie Burleigh, who has lived in the neighborhood for 11 years, started the garden in 2008 out of a desire to be more involved in her community and create a space for growing food. Inside, there are 35, squared-off plots. A total of 24 families grow their own food and plants, with some owning multiple pots. Demand is high for a chance to own a plot said Burleigh, as she points to a waiting list on a table outside of the garden’s entrance. She said right now the garden is only available to the community gardeners, but she is looking to open it up for the whole community in the future. Almost three years ago, Burleigh reached out for help to the Los Angeles Neighborhood Land Trust (LANLT), an organization that helps underserved communities develop and manage small parks and community gardens. The 5,000 square-foot space that was being maintained by community gardeners was at risk of being taken away. The property owner owed $100,000 in back taxes, but LANLT was able to step in and also find philanthropist Erika Glazer. Glazer donated $150,000 to pay off the taxes as well as upgrades to the garden. Burleigh said she is surprised that the community garden has been able to survive. “It’s a great way to be a part of the community and to get to know people and connect with people everyday,” said Burleigh. What used to be a devastated, vacant lot is now Los Angeles County’s first park with drought-resistant plants, permeable pavement, recycled materials for both park benches and tables, and solar lighting. 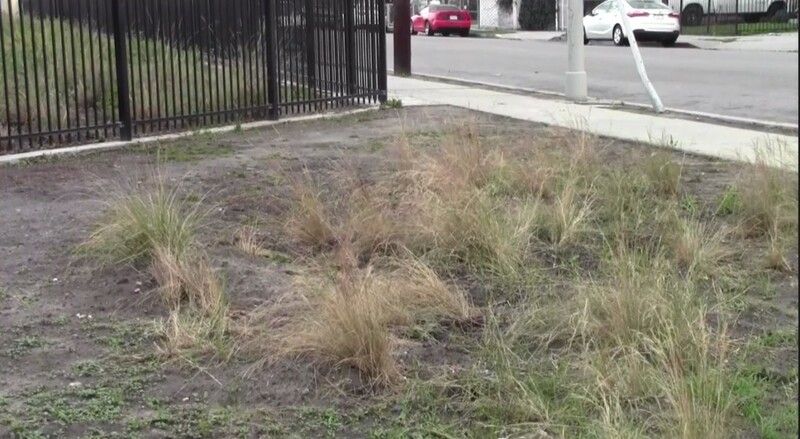 About 100 students from Lillian Street Elementary School in Los Angeles participated in a contest to name the “green” park. Third grade student Natalie Torres submitted “El Parque Nuestro,” the winning entry. 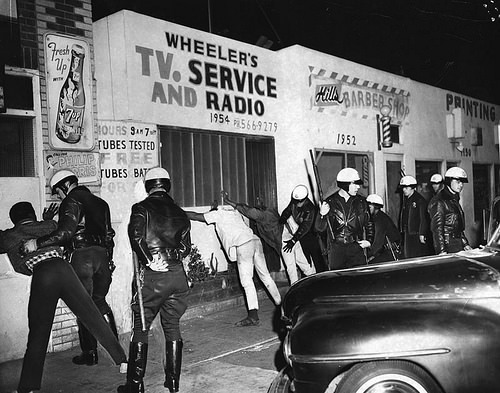 Before the park entered the community, an area often referred to as “park poor,” the nearest park in the neighborhood was Roosevelt Park, one that was about a mile away on Nadeau and Beach streets. But with the addition of private-public partnership housing, Molina felt it was necessary to add “green,” recreational space for neighborhood residents. “We [will] save [on] energy, water and overall energy costs,” Molina said. Proposition 40, the California Clean Water, Clean Air, Safe Neighborhood Parks, and Coastal Protection Act of 2002, provided funds for the $2.1 million project. “Now, there is a close and convenient park for everyone in the community to utilize,” Molina said. Los Angeles County Department of Parks and Recreation planned a summer of activities for Los Angeles county families and youth. 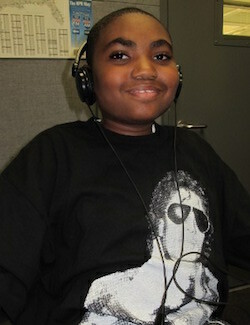 Youth summer camps will begin between the last week of June and the first week of July. They will run from Monday through Friday at about 10 a.m. until 3 p.m. Hours and fees may vary from park to park. Los Angeles County Department of Parks and Recreation will begin registration for summer swimming lessons on June 26, July 10 and 24, and August 7 and 21. The fee is $20 for a 10-lesson course. For more information about park services, please contact (213) 738-2963. Plans to make Los Angeles Unified School District the most sustainable in the country continue to grow despite budget cuts across the district. In February the district announced plans to move forward with a $350 million plan to install solar panels on eight district buildings. The goal was to produce 50 megawatts of solar energy, the equivalent of removing 23million pounds of carbon dioxide from the atmosphere. Since the solar project is funded entirely through local bond Measure Q, a 10-year bond totaling $7.2 billion, it is not affected by the statewide budget cuts. Randy Britt, Director of Sustainability for LAUSD, said the project would ultimately provide thousands of green jobs without taking money away from the general fund. “The completion of our projects will actually provide significant returns to the General Fund, which will ultimately relieve future pressure on the budget,” Britt said. Recent graduates of one of LAUSD’s adult schools, the East Los Angeles Skills Center, will be the first offered jobs installing solar panels on district buildings. Robert Salceo, a student at the skills center, said the new green jobs give him the job security he didn’t have when he worked in construction. With the “We Build Green” card Salceo said he could make between $28 and $36 an hour–$12 more per hour than his previous job. While statewide budget cuts are not hurting LAUSD’s plan to install solar panels, the cuts are impacting students at the ELASC. According to Brian Hurd, Director of the “We Build” programs at ELASC, the school has taken a 30 percent cut across the board, meaning less money for classes, supplies and teachers for a waiting list of more than 400 students. Hurd said they are looking at creative approaches to keep the classrooms open for students in the “we build” programs. One possibility is closing other less popular classes to make room for more “we build” classes. 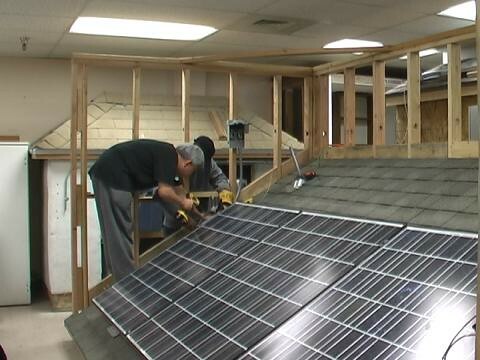 Still, the first group of students will graduate from “We Build Green” on Saturday and move on to jobs with the district and other independent solar contractors. “The new group of ‘We Build Green’ students started yesterday and the class is packed,” Hurd said. Hurd has been working closely with partners in the solar industry to gain as much support as possible for the program during these tough economic times. Britt said architectural and engineering preparations are well under way for the eight sites already approved by the Board of Education. Installation will begin as soon as the Division of State Architect approves the plans. The Department of Sustainability has also finalized surveys for another 100 sites, meaning even more job opportunities for the hundreds of new “We Build Green” graduates.